Stephen Keshi has been officially re-appointed as Nigeria coach, two weeks after the Nigeria Football Federation replaced him with Shaibu Amodu. He returns after intervention from Nigeria President Goodluck Jonathan. The 52-year-old had paid the price for poor results in qualification for next year's Africa Cup of Nations but has now been given a chance to make amends. Nigeria face Congo and South Africa in November, needing two wins to stand a chance of making it to Morocco. NFF president Amaju Pinnick and head of the NFF Technical Committee Felix Anyansi-Agwu confirmed in a statement that Keshi will oversee the team's final two ties. Keshi led the team to Nations Cup glory in 2013 and also steered the Super Eagles to the last 16 at this summer's World Cup in Brazil. And he will be determined to avoid failing to qualify to defend the African title won in South Africa. 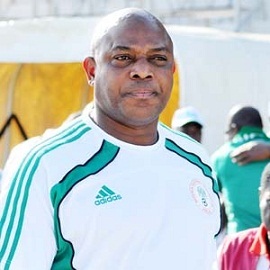 As well as the backing of President Jonathan, Keshi also has the support of Amodu, who requested for Keshi to be allowed to finish the qualification campaign. And Keshi has swiftly named his squad for the match against Congo on 15 November and South Africa in Uyo, southeast Nigeria, four days later. Villarreal striker Ikechukwu Uche, whose last appearance for Nigeria was in the final of the 2013 Nations Cup final, is handed a return. But there is no place in the squad for Stoke City's Victor Moses and in-form striker Obafemi Martins has also been overlooked. The African champions need to not only win both matches but also to beat Congo by a margin of two goals to stand any chance of automatic qualification. Meanwhile, Nigeria are still waiting to learn if they have avoided a lengthy ban from Fifa after a regional high court overturned its recent decision to void last month's football elections. Fifa had given Nigeria until Friday to reverse last week's ruling by the Jos High Court that annulled the 30 September election of Amaju Pinnick as Nigeria Football Federation president.